Back on January 13, I posted the cover art for the Silver Laughter advertising booklet. Upon opening that cover, here are the first two pages of that piece. I am pretty sure Jon and Kim’s dad, John, put this together. He did most of the early promotional material for the band. He worked at The Rock Island Arsenal printing shop into his 80’s. On page 1 (which is the back of the front cover) is the Lewis Carroll poem from which the band’s name, Silver Laughter, came. Below that is a photo of the Ludtke’s Dalmatian, Lucky, on Kim’s drums. 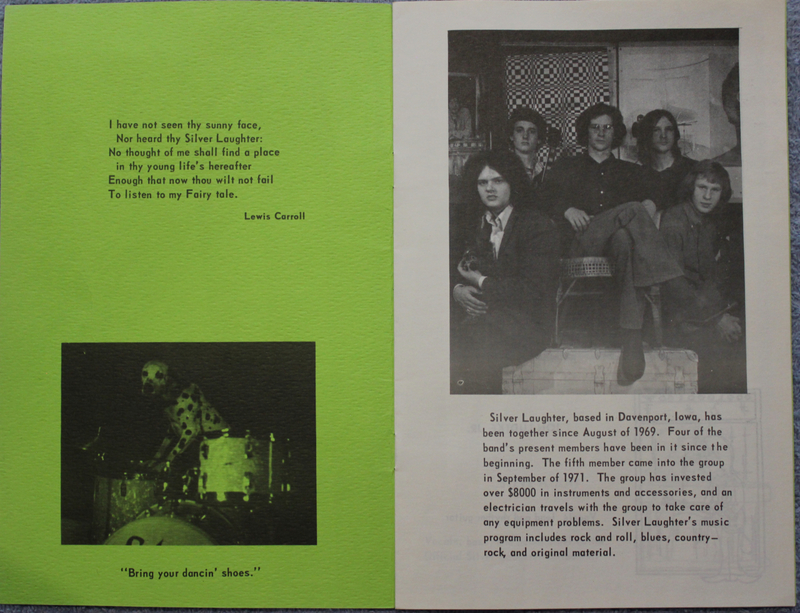 Page 2 features a little band history along with a photo of Silver Laughter; Steve Elliott, John Carstensen, Denny Walton, Jon Ludtke and Kim Ludtke.